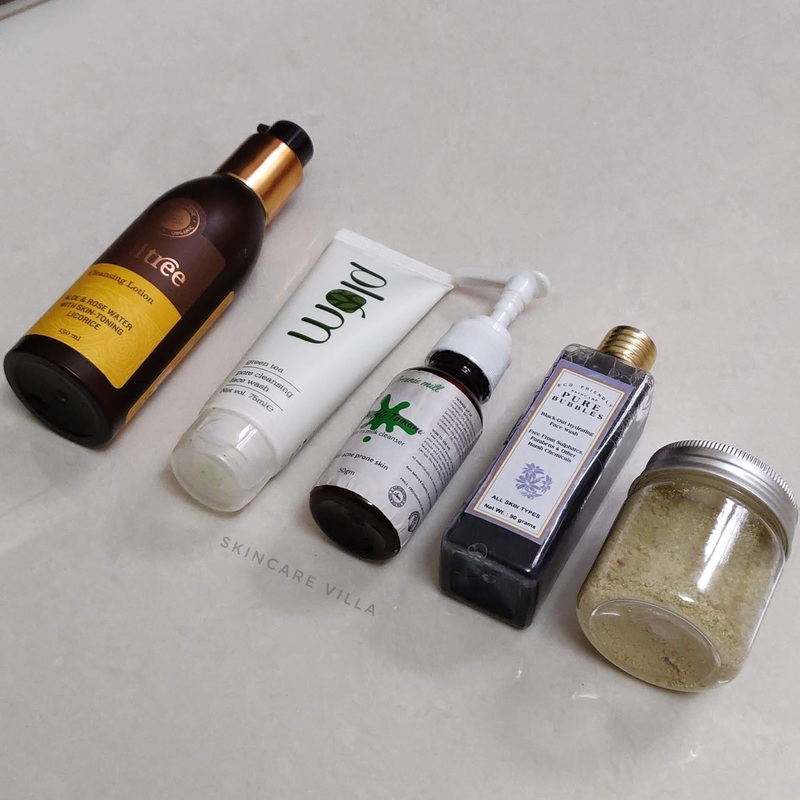 As the year is nearing the end, I would like to mention a few of my favorite cleansers which have I have been using and have also helped in keeping acne at bay. Some of them I have even repurchased. Let's head straight to the post and check the products. I love using this one especially since the weather has turned cold and dry. I am a fan of cleansing milk and this one has to be my favorite lotion of all. I love the fragrance of this cleanser and the squeaky clean feeling it gives. 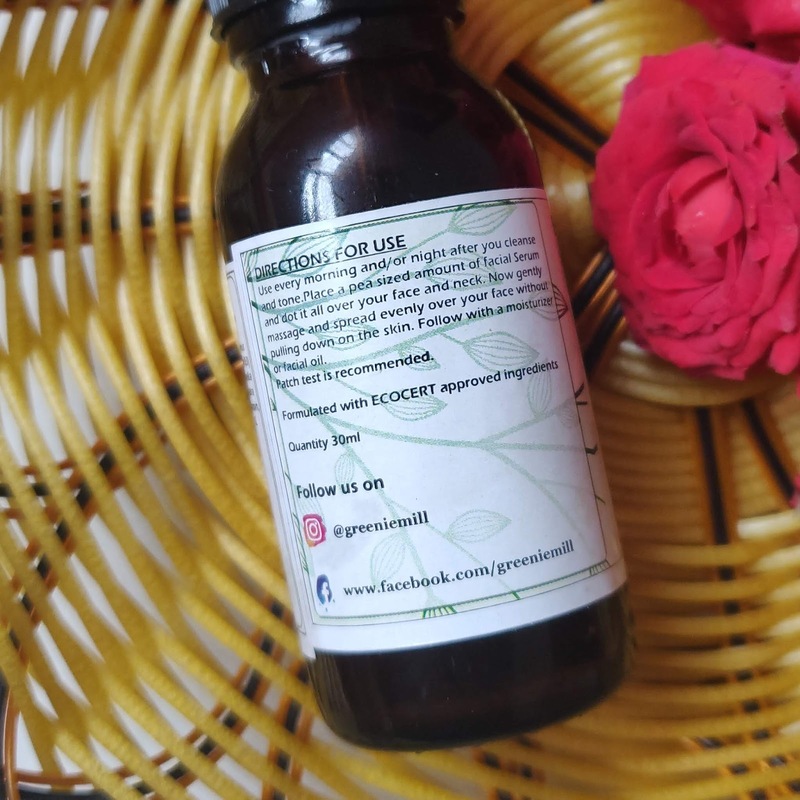 Moreover it is loaded with acne combating ingredients and a must have for my acne prone skin. This also makes my skin very buttery soft. I have already repurchased this cleanser. I like using it when I come home after a day out. It is important to get rid of the pollution and dust the skin attracts. I like the non slippery feeling this face wash has and how it gets washed off easily. I am a fan of powder cleansers so much so that I started selling them . None of my creations impressed me as much as this one did. I am using it daily at night and my acne is at bay. So here is a list of my favorite and currently using cleansers. Some am about to empty and some are absolute favorite. Do comment yur favorite cleansers and types which you like! After using Himalaya Revitalizing Night Cream I thought I had found my holy grail night cream. But how wrong I was. 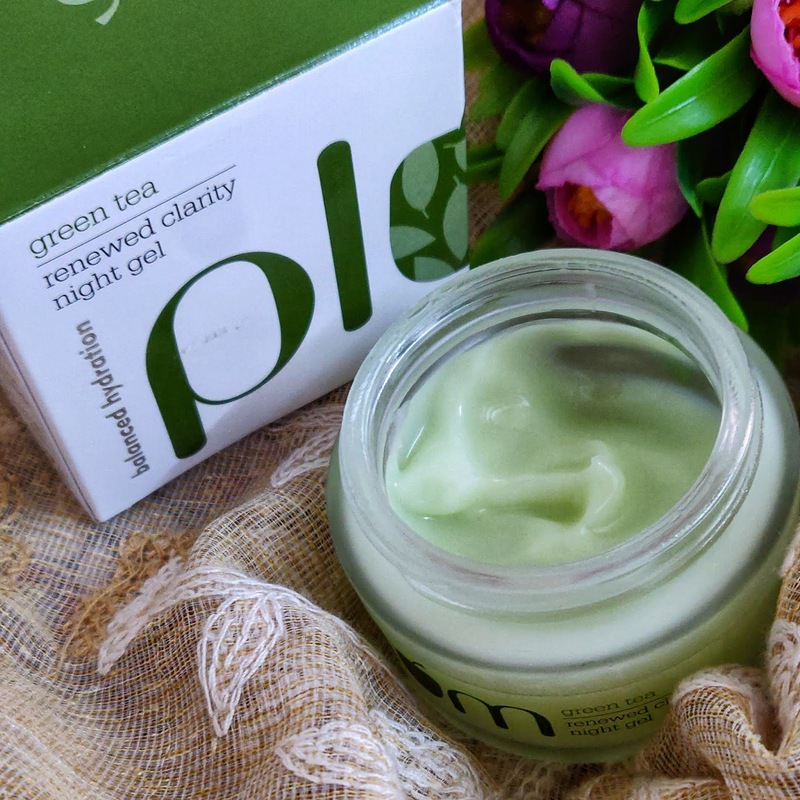 I had also used a sample size of Plum Green Tea Clarity Renewed Night Gel and I thought it was like any other gel cream similar to aloe gel. How wrong I was? I was totally wrong in judging the Night Gel each time I used and then I guess the gel itself decided to prove me totally wrong 😁. Read the review to know more. The packaging is pretty nice, heavy frosted glass jar with a double lid. I like the packaging as it gives the luxurious brand feeling 😁. The night gel is ofcourse gel in texture which isn't runny at all. It has a very light weight texture. The gel doesn't slip on hands or fingers once you try to scoop out from the tub while applying. This texture reminds me of the texture which is when we try adding oils to the aloe gel. However this gel is neither watery nor oily. The gel has a faint hint of green, very faint. The gel as such has no overpowering fragrance, but a faint fragrance which the whole Green Tea range of Plum has. I love the fragrance! The gel gets absorbed into the skin as soon as you apply it. I am absolutely stumped by the fast absorbing capacity of the gel. 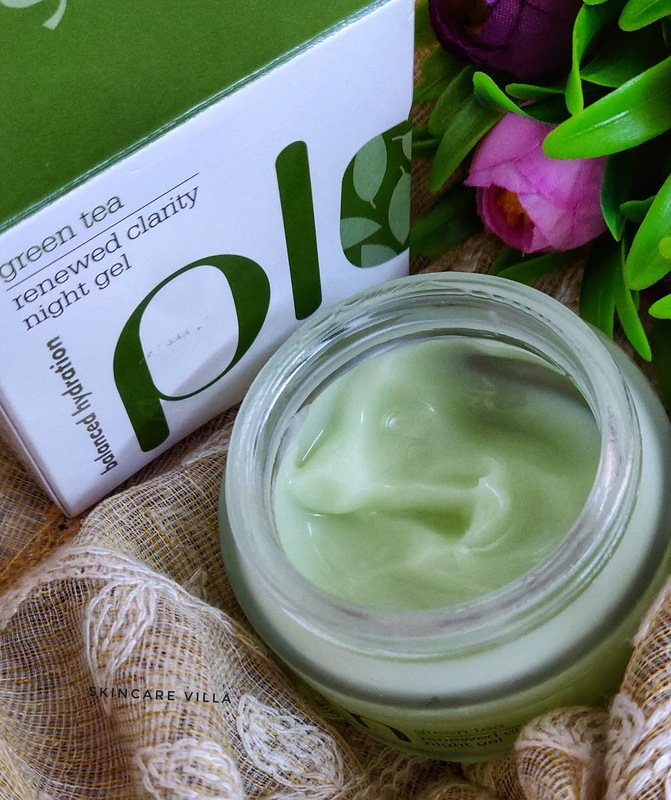 The gel leaves zero sticky or oily feeling on the skin. Plus while doing so it also doesn't give a heavy hydrating effect also. The balanced hydration claim of the brand is so true that it absolutely hydrates the skin perfectly while giving zero sticky or greasy feels. Recently I am not able to follow a consistent skincare routine due to my hectic schedule. Result, I had to deal with some big cystic acnes. 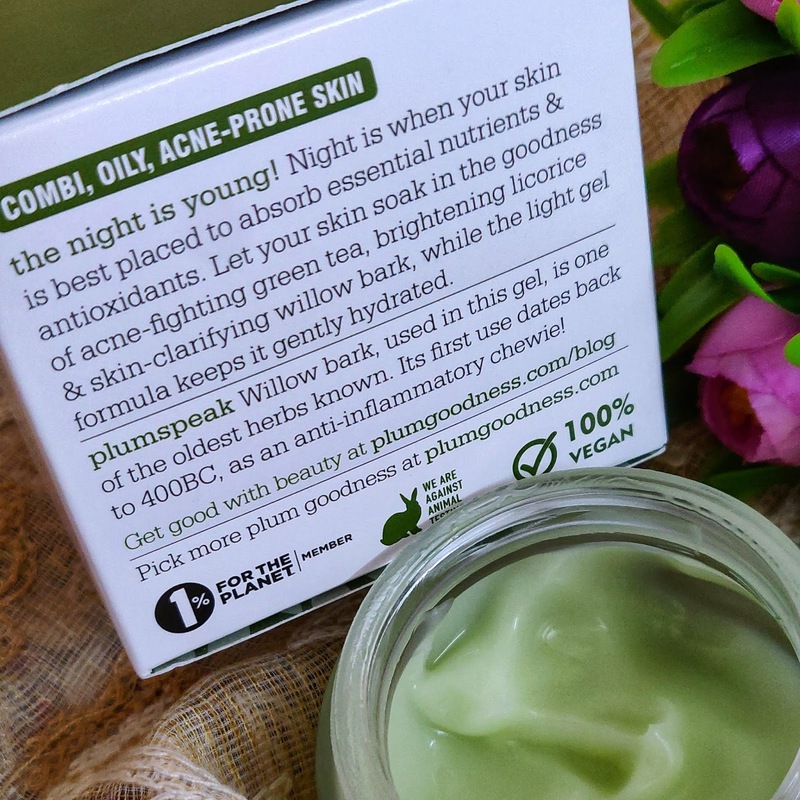 So after shrugging my laziness I again started my night skincare routine wherein I used this night gel consistently for 10 days and my acne has reduced completely without leaving a considerable mark. Earlier also I was using the gel but I didn't find any difference in the skin since I had no acne at that time. The gel also leaves the skin very plump, hydrated, even toned. Even in the morning the skin looks refreshing and plump. The major concern is it reduces my acne. As of the clarity claim of the brand I haven't seen a considerable difference in the acne marks or pigmentation. But am not concerned about it the moment. All I can say is this is the best night gel an acne prone oily skin can get. Price, Shelf life and Availability - 575 INR for 50 gms often on discounts (I got it at 46% off :D). Shelf life of 2 years and available easily on major shopping portals. Plum Green Tea Clarity Renewed Night Gel has been a saviour for my skin when I had big acne due to not so regular skincare routine. I have used it on and off only to see that my skin feels refreshing and plump in the morning with reduced acne sizes. What more can an oily acne prone skin ask for? I am soon going to repurchase it. Few weeks back Imiana House hosted a surprise giveaway on Instagram wherein their new launch Rose Clay Mask picture was posted and main Ingredients were to be guessed. I guessed the Rose Clay as the first ingredient. When results were announced I was surprised to see my name as a winner. After using the mask for a sufficient time here is my review. The unique formulation is great for All skin types. Its creamy texture glides smoothly over skin. No stretchy feeling post wash just smooth & soft skin. Imiana House Rose Clay Mask is housed in a plastic jar with a black lid. The jar also has an inner lid to protect leakage and spillage. Packaging is simple and travel friendly. 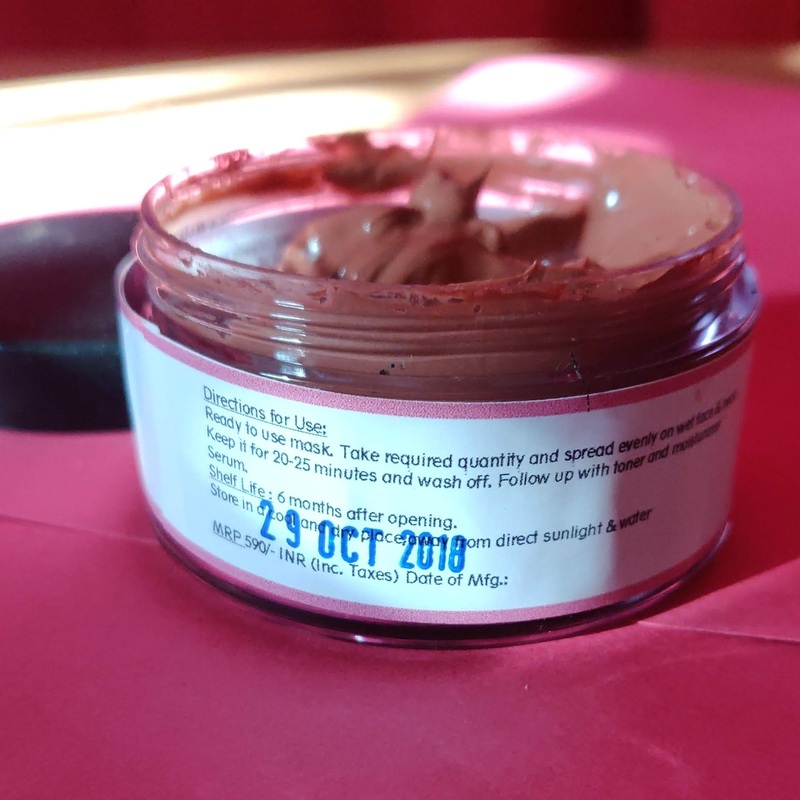 Imiana House Rose Clay Mask is dark, pale pink in colour. One can actually guess Rose Clay is one of the ingredients of the mask just by looking at the colour of the mask. The mask doesn't have a scent or fragrance as such. The texture of the face mask is a creamy which is more of a gooey sort. Consistency is smooth, soft and not too thick. 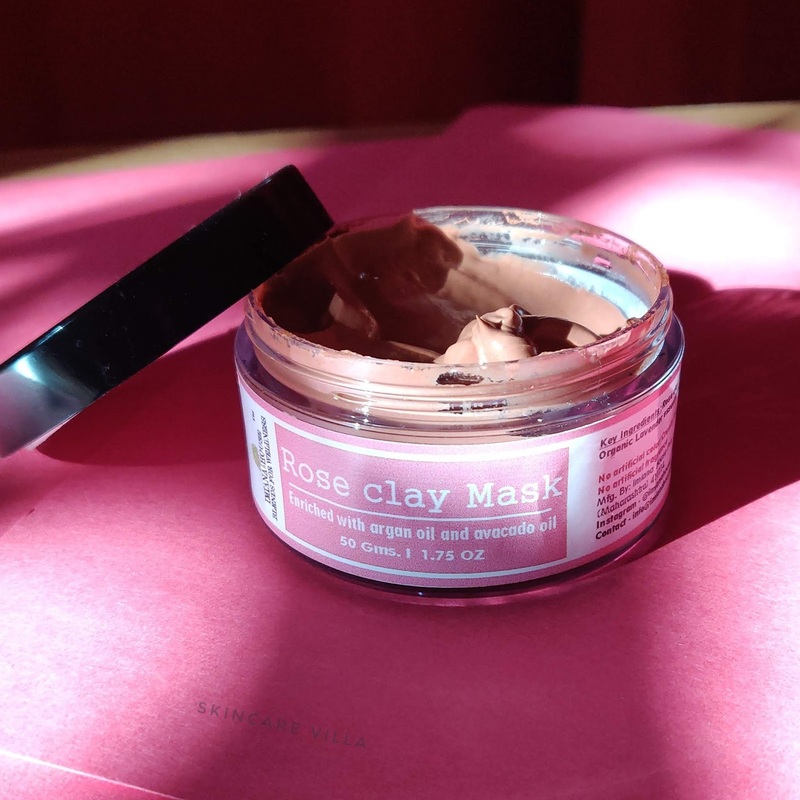 Imiana House Rose Clay Mask is easy to apply as it glides easily due to it's right texture. Due to the gooey consistency sometime while applying a uniform layer we tend to remove the already applied mask on the face. After washing my face with any powder cleanser, I apply this and wash off after 15 minutes. It gives a mild cooling sensation and I don't feel any irritation or any other feeling. Coming to the effects, my skin looks feels super clean, bright and has a radiant glow. My skin is deep cleansed and the mask also gets rid of dead cells which slough off after becoming too soft. The mask doesn’t dry out the skin, but it also doesn't cure any dry patches we have. Imiana House Rose Clay Mask is enriched with Rose Clay, Argan oil and Avocado oil. Since it contains rose clay, am assuming this mask will suit all skin types. Although a patch test is always recommended. Overall speaking the mask gives a healthy glow while getting rid of the impurities from the skin. Moreover it has argan and avocado oil which are responsible for the high price point of the product. But am happy with the quantity offered as a thin layer of the mask does the trick as well. Price, Shelf life and Availability - 590 INR for 50 gms with a shelf life of 6 months after opening. Available on Amazon, Qtrove and Imiana House website. 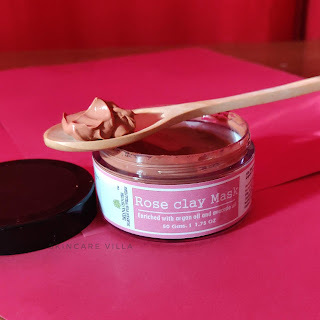 Recommendation - If you are looking for a change in face mask or looking to add something new to your existing collection I would recommend picking up Imiana House Rose Clay Mask. The mask has some unique ingredients like Rose Clay, Argan oil and Avocado oil which are beneficial for the skin and it effectively cleanses the skin while giving a nice glow to the skin. The quantity is sufficient enough to last around 3-4 months. This is Archana from IBeautySpy.com. Sonali had invited me to write a guest post on her blog and I was really happy with the chance. 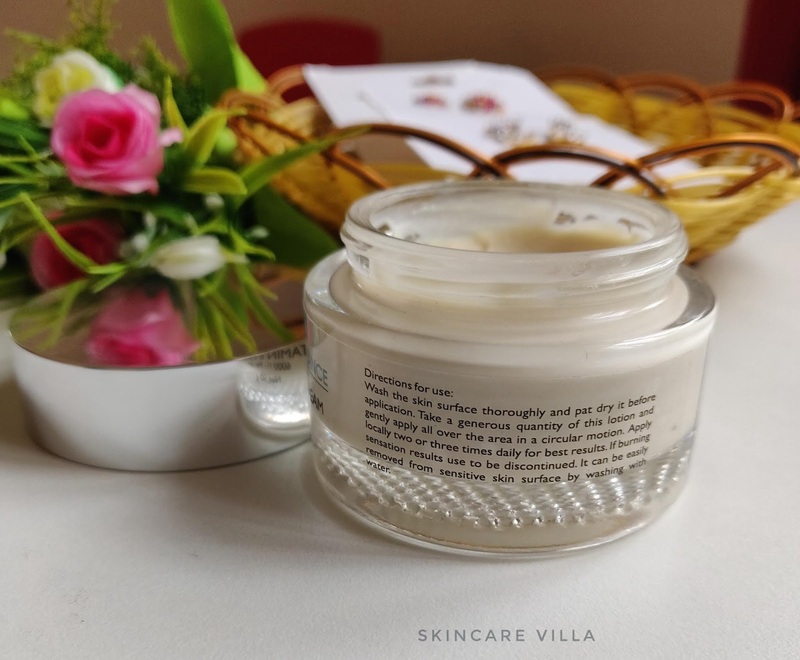 Skincare Villa is one of the first beauty blogs that I had subscribed to years back 'coz I liked Sonali's way of writing and creative topics. Years forward, I never dreamt I would have my own blog and be guest blogging in her site itself :) I just feel proud of the small steps I have taken in life, which has led me here. IBeautySpy is my beauty blog and I review many natural products and brands, skincare routines, beauty tips, etc. Here you can find review of the latest natural, organic beauty brands in the market. So let's move on straight to today's post. Am going to list down few of my favorite brands and recommended products from which I have personally tried. All of them are natural, cruelty free brands. Hope you find this post useful and interesting. In addition, if you wish to read detailed review on any of the product mentioned here, you can go to my blog and search for the same. Utkarshini is a certified organic skincare formulator. She has done the Formula Botanica course and whips up some amazing, unique products that you will never find elsewhere. Her 100x washed ghee has been a superb hit. She has many variants in that – haldi and rose for skin and mahabhringadi for hair. I have tried the Haldi one and it was awesome. Made my skin super soft, smooth and bright. If you have thought ghee is only for dry skin, then you will be surprised by the light, fluffy texture of this one. This brand is for all those who love DIY skincare and haircare. I myself like DIYs, but before Blend It Raw Beauty came in, I was always confused about the purity of the raw material. There are hundreds of brands in Amazon selling rose petals powder, neem powder, orange peel powder, clays, butters, etc. But none of them are well known brands and I couldn't trust them. 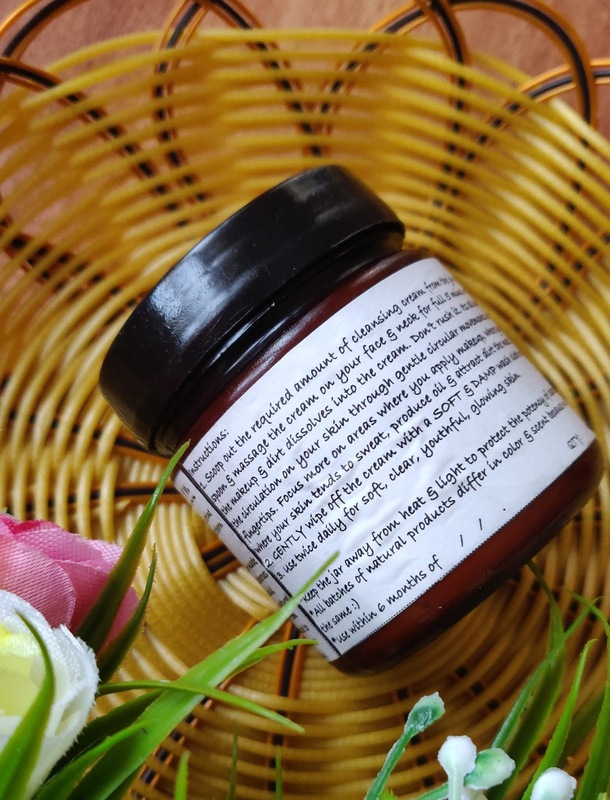 Blend It Raw Beauty is possibly the first popular DIY raw material seller in India. You can trust, Aarushi, the founder of this company, blindly. Their mango butter is my absolute favorite and I have purchased it multiple times. It has an amazing texture that you should definitely try atleast once. This is a luxury brand and their products are expensive. 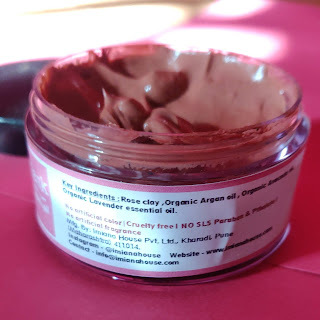 I have tried only one product from them – The Skin Pantry Hazelnut Vanilla Body Butter. And boy, I don’t have words to describe this product! First of all, it came in a brown paper packaging with gourmet stuff printed on it similar to McDonalds’ and KFC meal boxes packaging. I felt like I was receiving some freshly made food stuff 😀 And then the product itself was amazing! The scent reminded me of old, quaint English bakeries where they are freshly baking vanilla muffins and croissants. 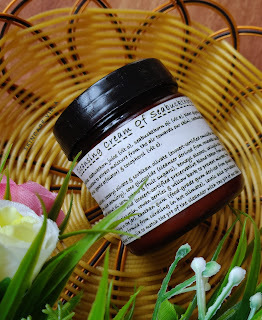 The body butter is super nourishing as well taking care of my extremely dry skin. This was one of my best investments. Its turned out to be not just a product, an experience altogether! Am looking forward to try other products from them - Vanilla Drench Face Moisturizer, Breakfast Scrub and Skin Smoothie Blue Clay Face Wash. I have tried many products from Aroma Essentials and saw good results with them. Also they are quite affordable compared to other natural brands in the market. As the name suggests, most of their products contain aromatherapy essential oils. 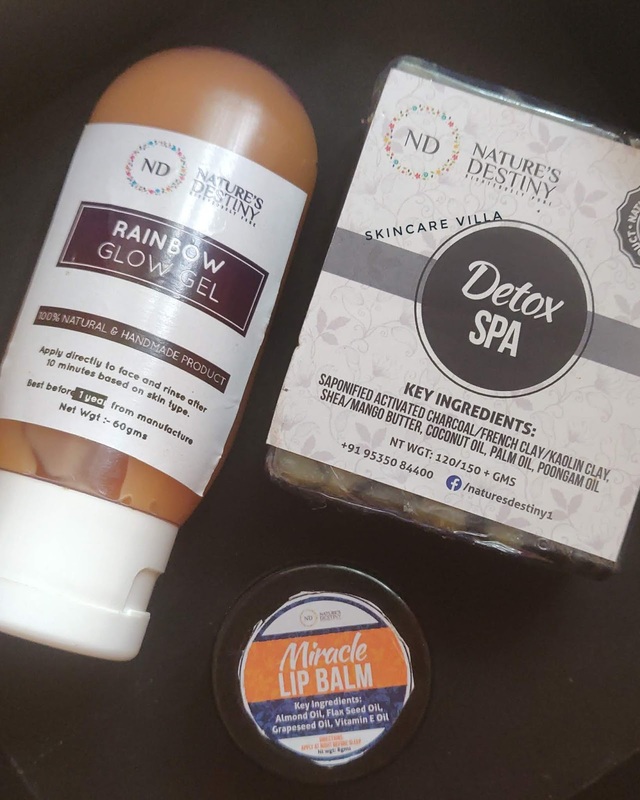 Though some say their products are not 100% pure or organic, I have felt good vibes with the brand, so I recommend them. If you have dull skin lacking glow or acne-prone skin, you need to try their products as they are really effective. Products I have tried and recommend: Tomato/Green Tea/Orange Face Washes, Lavender Hydrating Face Mist, AHA Pores Toner, Insta Clear Face Mask, Lip Balms. This was one of the earliest natural beauty brands that I tried when I started on my skincare journey. Back in that time (around 3-4 years back), there were not much natural, handmade brands in the market. I came upon Beauty Secrets on their Instagram page and decided to order some of their face packs. They are little costly but I found the quality really good and they showed results for me. Their Bridal Face Pack is one of my favorites till date. Probably the only 100% clean beauty brand that I know. They use only 100% natural and organic ingredients in their products. Like their body butters are just a mix of plant butters, carrier oils and essential oils. Unlike other brands which have a cream base body butter. Also all their products have a relaxing smell of essential oils which you will love and gives a spa-like experience. This brand is similar to Juicy Chemistry as I find them to be another clean beauty brand. But their products don't have strong essential oil fragrance unlike JC. So more suitable for sensitive skin. They are also organic and certified. My favorite from the brand is IMBOTOX Anti-Ageing Moisturizer, one of the best natural products for aging skin that works. I always wonder why this brand doesn't market much. Since many people are not aware of this brand. 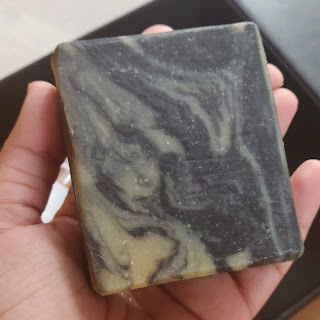 I have tried some of the products from Sand for Soapaholics and I was highly satisfied with them. Their gourmet products line remind me of the international brand Lush. 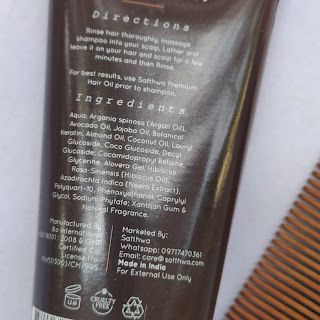 My first product from them was their Hair & Glory Hair Conditioner which I really loved. Its a different type of conditioner unlike our usual creamy conditioners. And it has a nice refreshing peppermint smell which will make your hair smell good all day. You can check out my detailed review here. 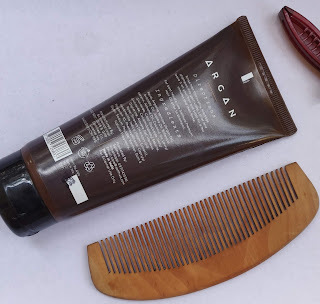 Products I have tried and recommend: Hair & Glory Hair Conditioner, After Glow Face Cleanser, Rhimjim Face Mist (this is a super hydrating toner and you won't need any moisturizer after this. 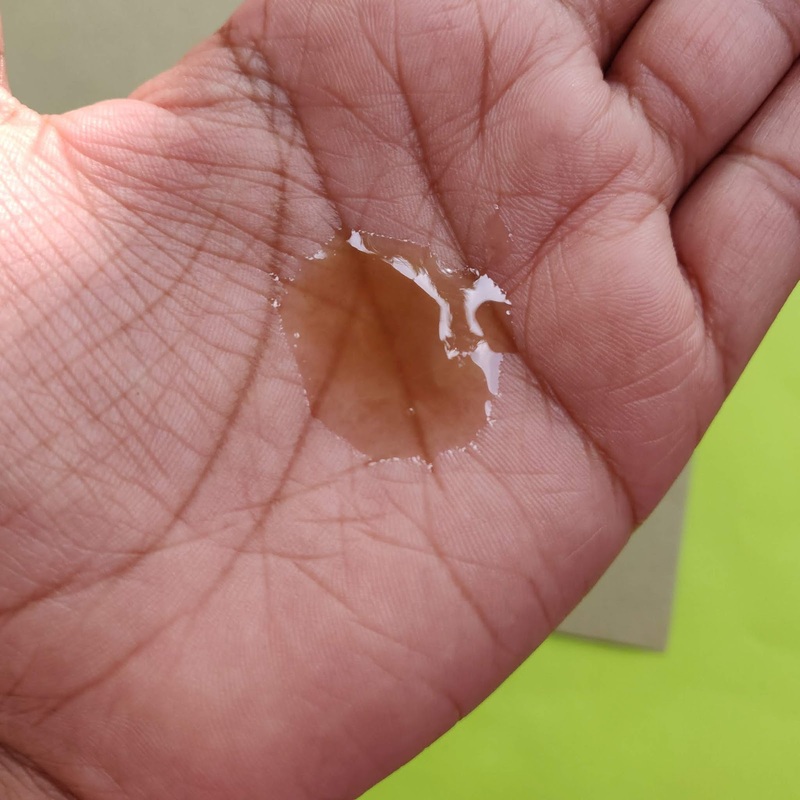 Similar to Korean hydrating toners, if you are looking for an Indian natural version), Turmerry Moisturizer. I also have the Red Banana Mask which I haven't tried yet. Will use and review. This is an ayurvedic brand and slightly on the expensive side. 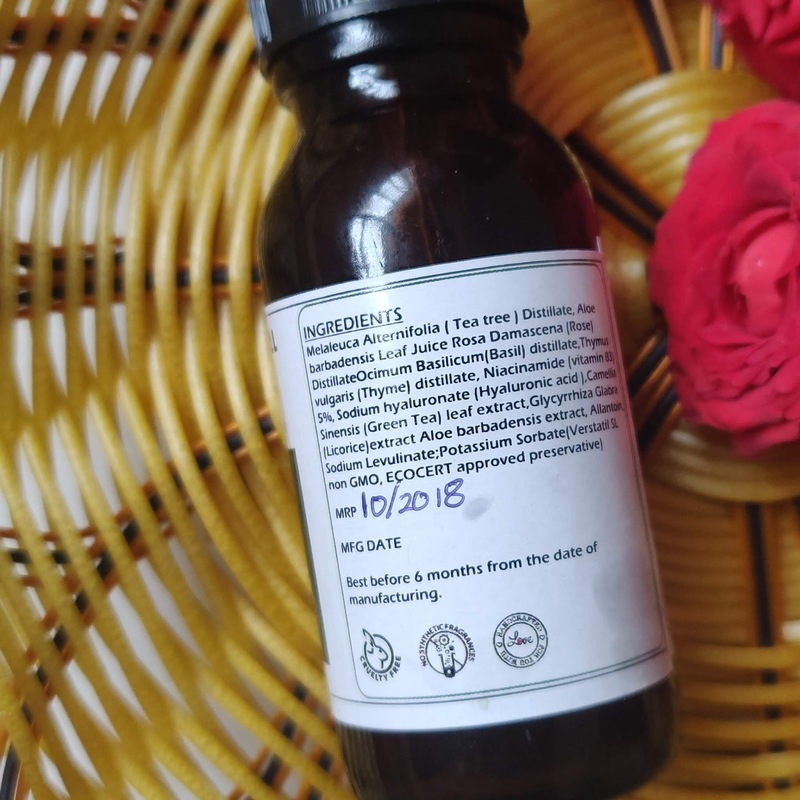 Their products are based wholly on ayurvedic principles and ingredients due to which some of them might have a strong, herbal fragrance. My favorite among them is their Pomegranate Kaya Kalp Elixir (gives illuminous skin) and Nutmeg Brightening Under Eye Tailam (this one really relaxes the eye area). Though pricey, I find them to be great investment. Also the quantity is bigger than other brands. I found this brand on Insta and decided to try it on a whim. Surprisingly, their shampoo and hair oil became my favorites and I repurchased them along with some skincare. I saw noticeably less hairfall as well as new hair growth with their hair oil. And the shampoo is one of the few SLS/SLES free shampoos that lathers well and removes oil. But they do have a herbal smell which some may not like. Recommend the Mogra Luminous Glow After Bath Oil. Its an organic certified brand. 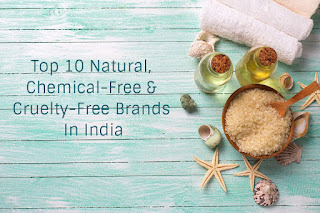 So this was my comprehensive list of the natural, chemical-free brands Indian brands that I have tried and recommend from my personal experience. Hope this was helpful to you. Please check out my blog and subscribe through email to receive more such reviews in your inbox :) Thanks for reading! This moisturising gel is prepared using a traditional Ayurveda recipe that soothes and softens skin. Olive and Jojoba Oil are combined with organic Honey to form a light, non-oily, nourishing base. Aromatic Sandalwood and Aloe Vera calm the skin and reduce redness. Potent herbs such as Lodhra, Tulsi and Neem control acne by purifying and tightening pores. As evident from the pictures, the packaging is classy, leak proof and extremely travel friendly. The nozzle has a plastic guard to prevent any direct damage or spillage. 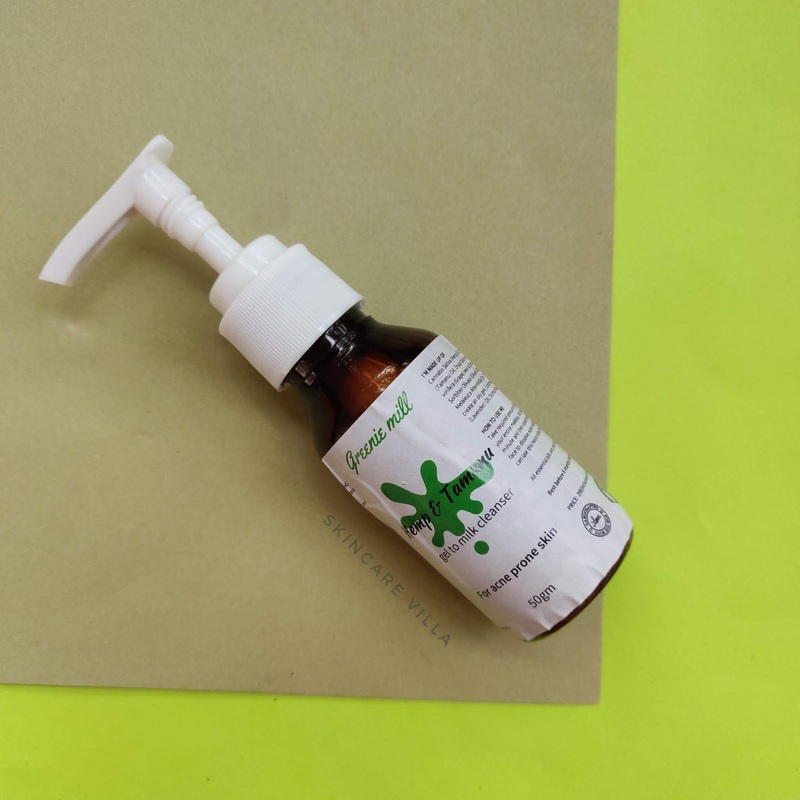 The SoulTree Moisturizing Gel, is light weight gel sort of moisturizer which is very suitable for oily skin type. Plus the product has ingredients which work for acne and hence this product is exclusive for oily, acne prone skin. The gel had a distinctive herbal fragrance which instantly reminds me of Tulsi. The fragrance isn't so soothing but a little strong although it's fades away quickly. I have used SoulTree Moisturizing Gel in the worst days of my skin, what better time than to test a product otherwise. 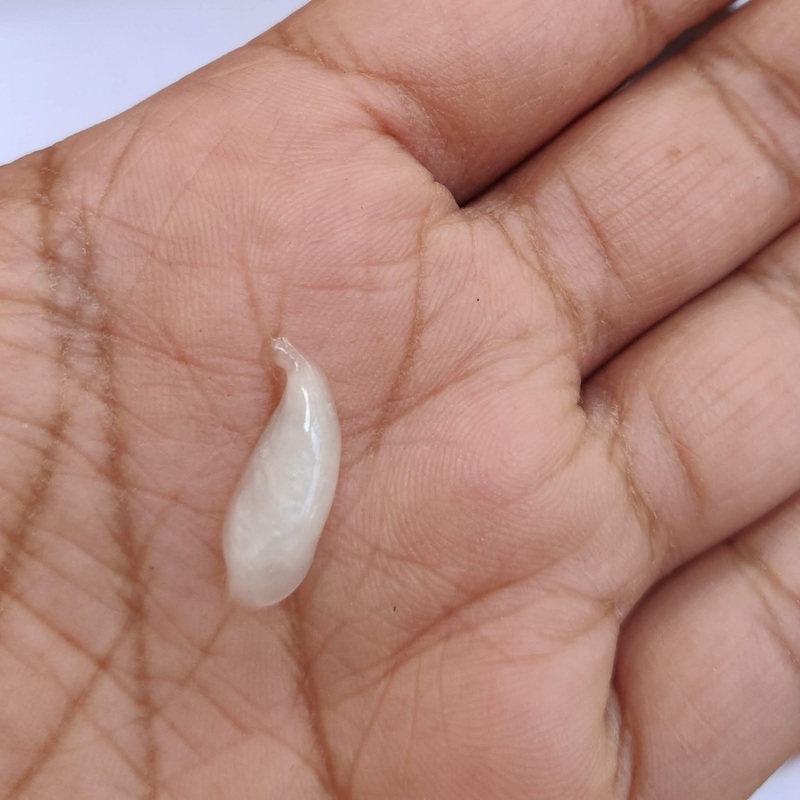 I was getting small zits due to humidity in monsoons and I was so fed up. 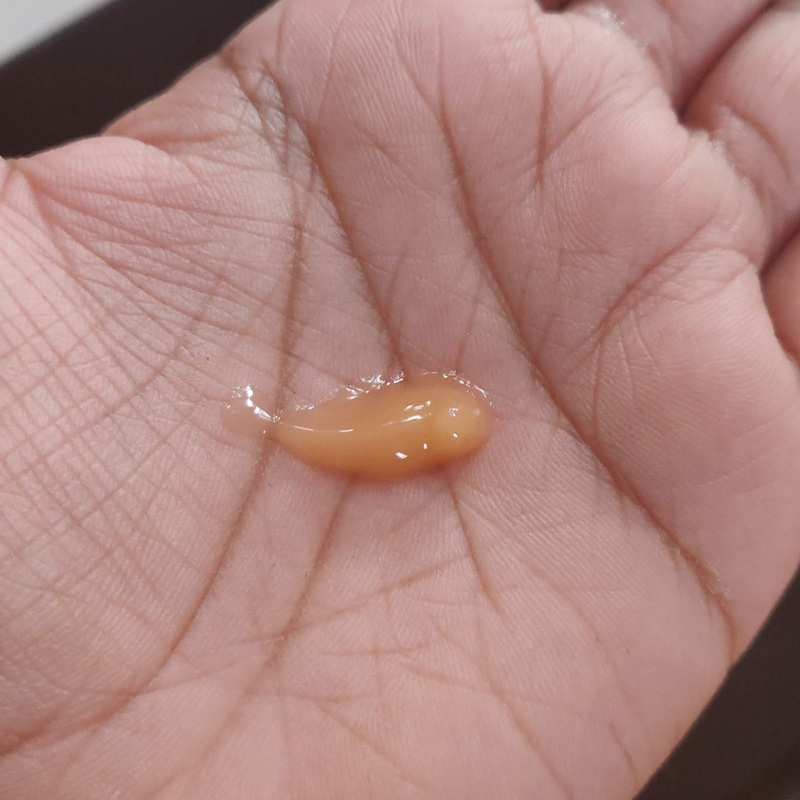 I regularly used the SoulTree Moisturizing Gel and I had some relief. My small zits stopped appearing frequently (although they still did show up here and there) plus the current ones were dried out quickly without leaving a considerable mark. Plus apart from this the gel tightens the skin a little bit. Also regular usage prevents junk from clogging the pores as skin appears healthy and oil free. I totally love the SoulTree Moisturizing Gel for my skin when it is going through a rough phase. However no pain no gain, the price point of the product is whooping high. SoulTree is certified brand and the certification they have needs renewal every year, so you can really stay assured about the quality product you receive. Plus the product does live up to it's claims and I don't mind the price. Price, shelf life and Availablility - 450 INR for 40ml with a shelf life of . Available on major shopping portals. 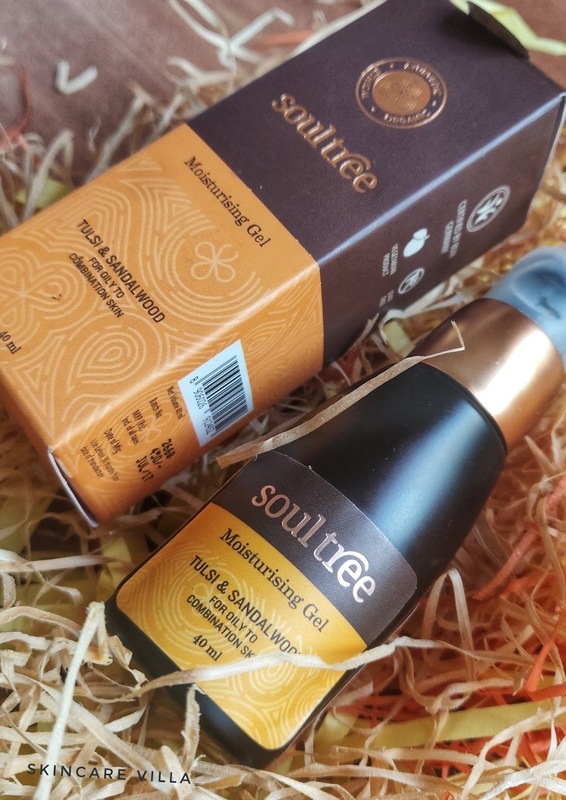 SoulTree Moisturizing Gel is a perfect moisturizer for oily acne prone skin. It not only reduces the breakouts but also dries up the existing acne. How cool is that. What other than this an oily, acne prone skin would expect? I totally loved the effects the gel had on my skin. SoulTree products are free from harmful chemicals and are certified by BDIH Germany. I am almost about to finish the bottle but ahve kept some amount of product for worst skin days. I have been into face oils since long. 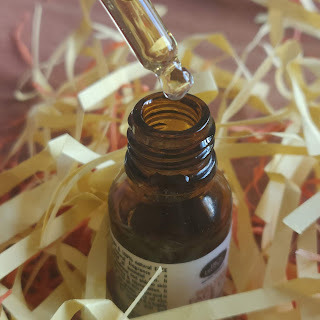 As far as I remember, my first face oil was Grapeseed Oil from Blend It Raw. Different face oils are formulated keeping a certain effect in mind, for example anti acne, anti aging benefits or radiance boosters. Let's check whether Biobloom Face Oil is worth the price or not. Packaging is luxurious with a golden cap and glass bottle. Most facial oils have glass bottle packaging which prevents the oil from sunlight or UV Ray's. However I usually don't carry glass bottles during travel. Speaking of the aroma of the face oil, it's amazing and spa like. The fragrance lingers a bit but isn't bothering at all. Coming to the consistency and texture, the oil has a nice spreadable consistency and light texture. It gets absorbed well and doesn't leave an oily film on the skin. It sinks right into the skin. 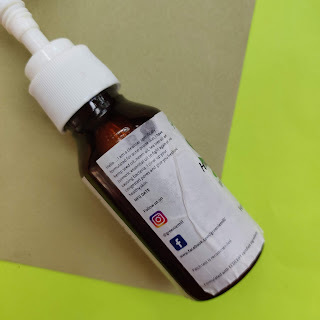 I use this face oil as an overnight treatment and just 3-4 drops are enough for my oily acne prone skin. The face oil sinks into the skin effortlessly and gives an amazing glow to the skin. The face oil has noticeable tightening and brightening effects on the skin. I could see some fine lines on my forehead being tightened with a regular usage of few weeks. 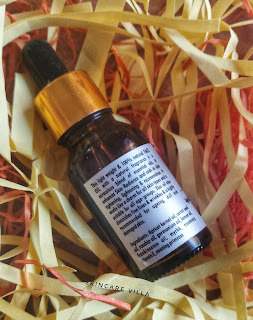 The fragrance of the Biobloom Face Oil - Age Defying & Radiance Booster is literally out of the world. I mean you can keep on sniffing it and still not get over the fragrance. 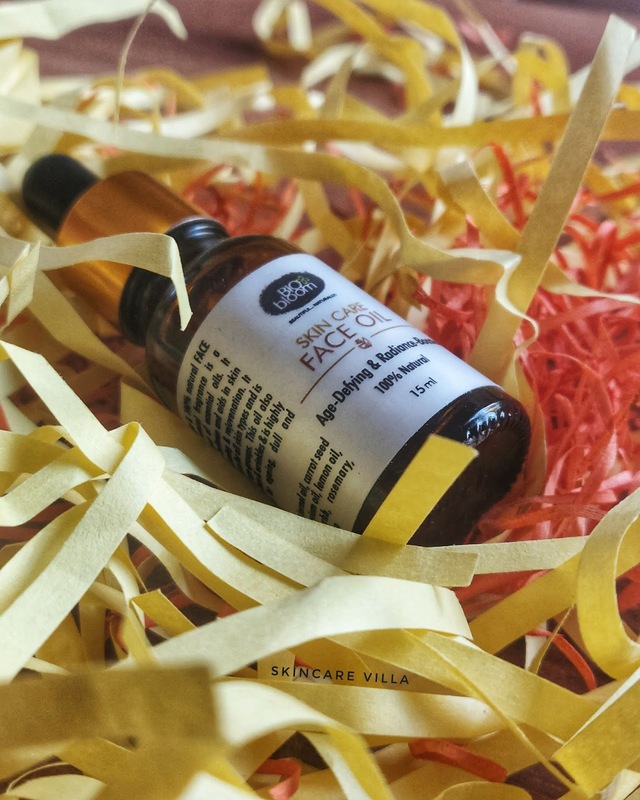 The face oil gives a nice glow to the skin while making it soft and supple. 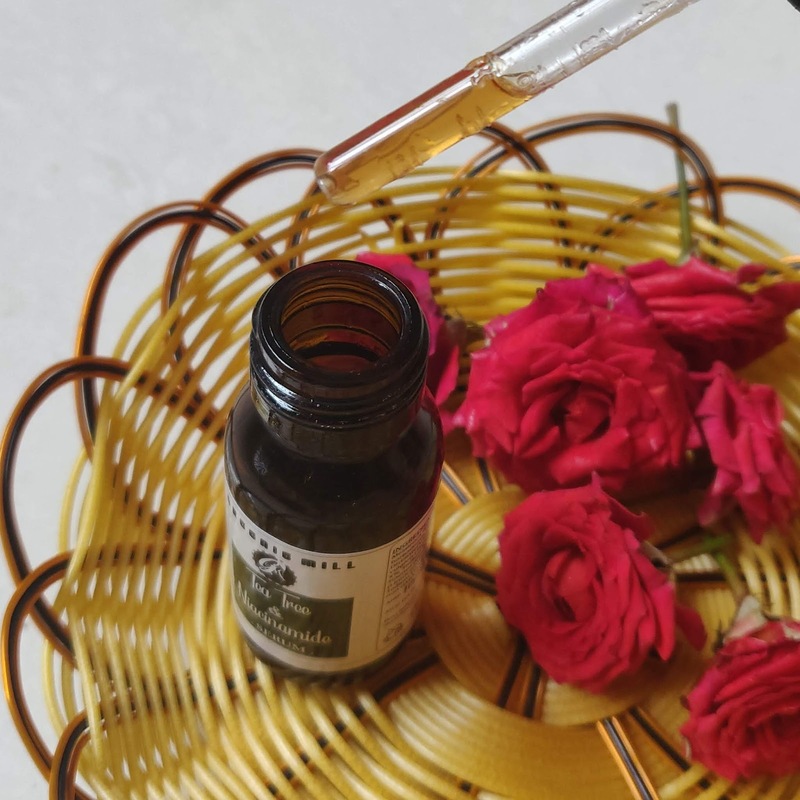 If you want to incorporate a good face oil I would recommend Biobloom Face Oil - Age Defying & Radiance Booster, but the price is hefty. Price, Shelf Life and Availablility - 1499 INR with a shelf life of 2 years. Easily available online. 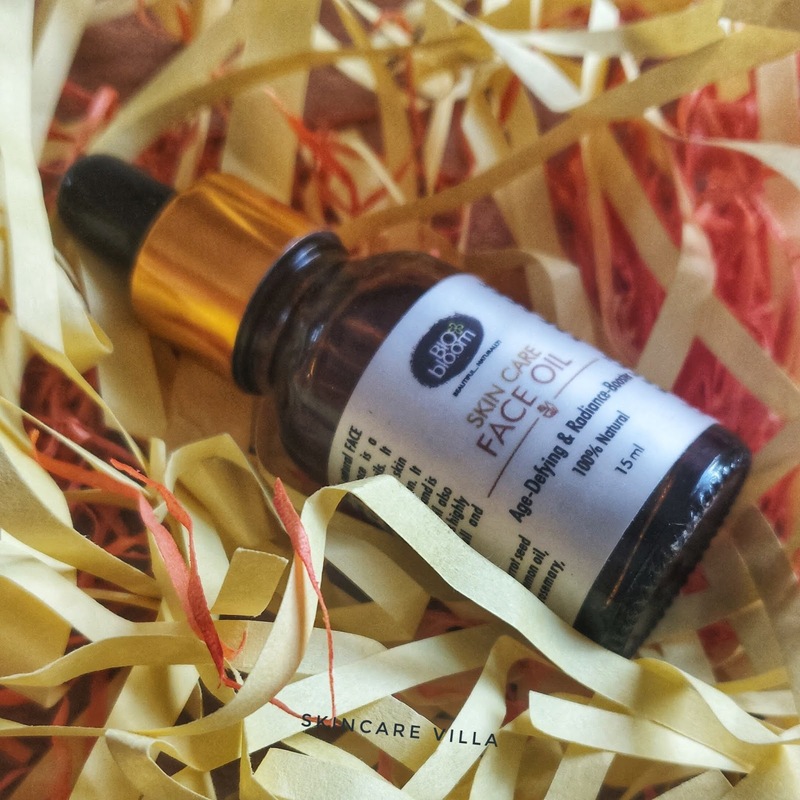 Biobloom Face Oil - Age Defying & Radiance Booster is everything what we look into a face oil. The radiance and skin tightening effects it gives to the skin are noticeable and real. The fragrance is one of a kind and definitely keeps you longing for it. However all this comes at a hefty price. I have picked it up on discount, heavy discount. But if you spot it in any subscription boxes definitely get yourself one. I have never posted a review of Moolit Products (guilty 😐). I had purchased 100 times washed ghee and Neem Gel to Milk Cleanser but couldn't use them regularly and hence couldn't review them. 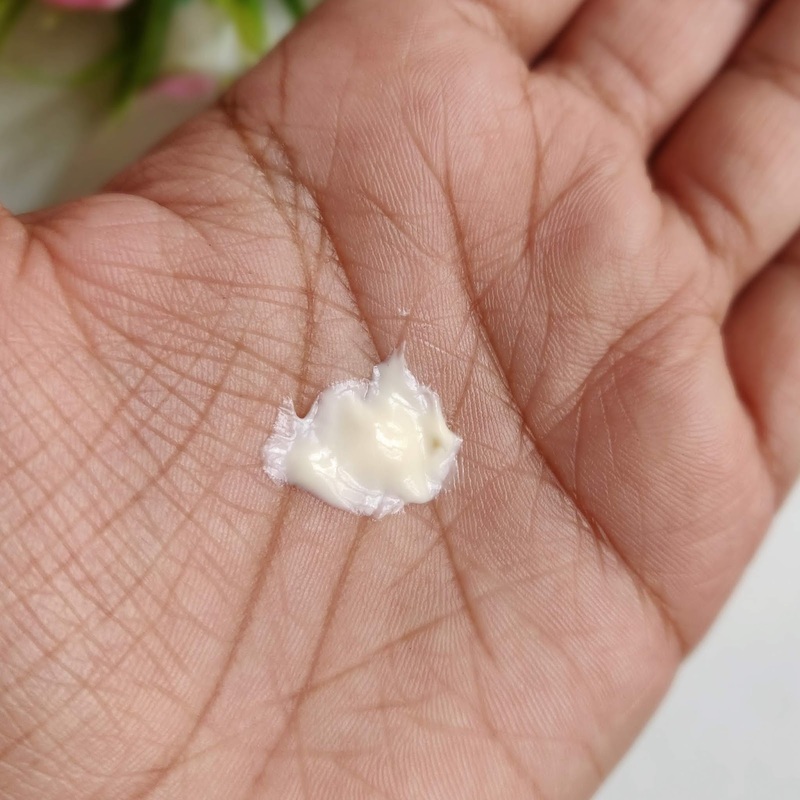 After using the Seabuckthron Cleansing Cream for a few weeks here are my thoughts about it. The packaging and labelling is simple, all instructions and ingredients are mentioned on the packaging. The product is housed in amber coloured plastic jar and is leak proof. The product has a creamy consistency and is little runny in nature. We need to shake the jar before usage as I have noticed oil and cream texture a bit separated. The fragrance of the cream is citrus, it's of seabuckthron. The fragrance isn't much lingering, as long as the cream is on your face. Once wiped off it doesn't linger. Once massaged into the skin the cleansing cream gives a soothing effect. I massage well into my skin and leave it off for 2 minutes roughly, I don't have patience to leave a product which needs to be wiped off from face, like cleansing milk or cream or any cleanser. Once I start wiping off with a damp cotton, I can actually see the grime and dirt being wiped off along with the cream. If we try wipping off hard or for more number of times the cleansing cream stings or gives a little burning sensation on the active acne or sensitive area of the skin. After I noticed this, I stopped wiping hard or for more times than usual. Coming to the efficiency, the cleansing cream helps in deep cleansing the skin, leaving the skin clean, soft and supple. I have noticed a considerable effect on my acne marks as they have lightened a lot. Skin feels super clean and clear that you cannot keep your hands off the face. I use this cleansing cream once in while, can say on a weekly basis and am happy with the results. It hasn't caused any breakouts or didn't give me any irritating feeling. Initially when I tried the cream in humid weather I thought it caused me breakouts, but I was wrong. It was due to the weather, and not the cream. I haven't tried removing any makeup with this cleansing cream, as I rarely wear it. Overall speaking, I like the cleansing cream to deep cleanse my skin once in a while. The cleansing cream not only cleanses but also reduces the acne marks and makes the skin soft and smooth. I am in love with the Moolit Cleansing Cream of Seabuckthron as a pamper session for my skin. Moreover next time, Utkarshini, the chief formulator of Moolit is going to come up with a self preserving formula of the cleansing cream. I am already eyeing the next version 🤩. 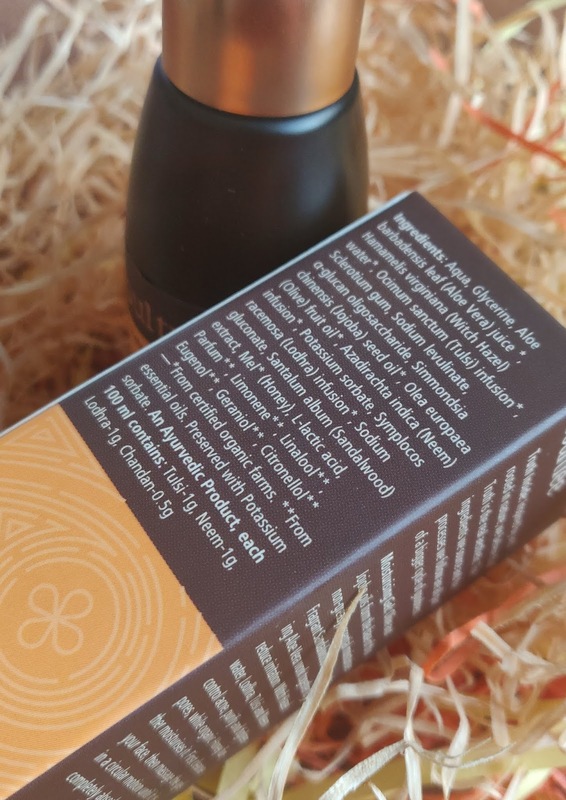 To buy the cream you need to message @moolitbeauty Instagram account. 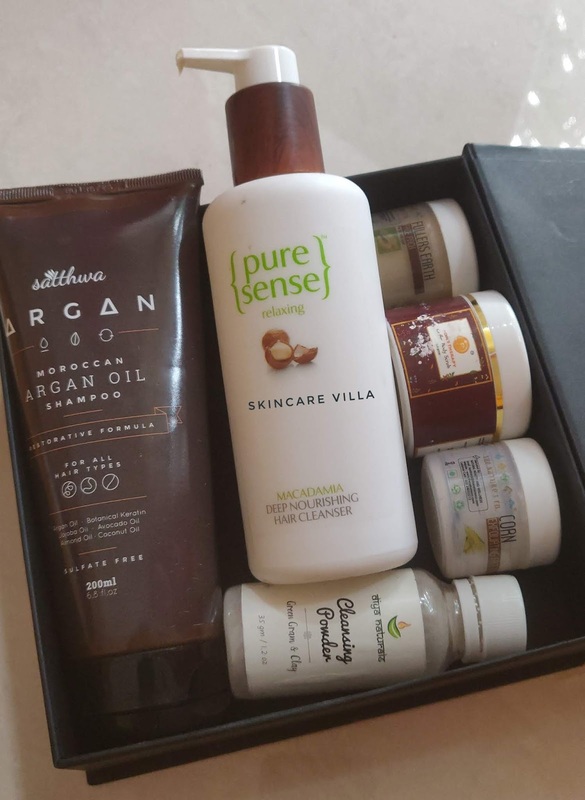 Plum Goodness, review, skincare, Skincare Villa, SoulTree, The Nature's Co, What's in my Travel Skincare bag? Ever since turning to minimalistic skincare routine, things have been pretty good for my skin. I use aloe gel day and night, I am absolutely not using any oil on face. Once in a while am using the same face pack on my face and same face wash since many months. Let's get into what all I carried in my bag for a one week trip. Am about to finish this off and I used this once at night before hitting the bed. So far this has been good to my skin and am happy with the results. Many people rave about it, let me also fall in love with it. So I carried my own creation this time, I absolutely didn't feel excited about using this one. But hey can anyone tell what's the hype about this one.? As you guys know am using aloe gel since past 3-4 months. I have Kaira Naturals aloe gel with me but it's refrigerated so I don't want to have any temperature differences in it. Hence carried this one. This is a new purchase and am absolutely loving this. Carried it in another container as I don't want to carry glass packaging. Used it every single night on my vacation and am in love with it. I carried the face mist in an empty spray bottle of The Nature's Co rose mist. I absolutely didn't like TNC rose mist, but the small spray bottle is so cute and it's a keeper for me. I carried this one with a lot of doubt in my mind whether I I will be able to use a cleansing lotion or not but I used it around twice and had a good experience. The only thing is the lotion tingles a bit if left for more time before wiping off. My absolute favourite mask, am carrying in another empty container. Used it twice in one week and my skin is super clean and healthy till now. The cute small tub takes up so small space in the bag. I have Juicy Chemistry under eye cream with me, but am yet to review it and one don't want it to get damaged or anything. Plus it leaves stain, so carried this one. This is super nourishing and ultra moisturising, but I didn't use it :(. I absolutely like the fragrance and non sticky feeling of this lotion. This is on my empties list so I carried this one and am happy with the results. Although I don't like the fact that Biotique says that it's a preservative free product when it contains water as an ingredient. So this is all what I carried with me for a week trip to my husband's hometown. I am glad I could actually follow my skincare routine and didn't give a break. I am absolutely loving the aloe gel effects on my skin and I cannot stop raving about it. Am happy to be posting another empties post today. It's a mix of Skincare and haircare which I have been using over the past free months. Let's get started. I have used this face pack when I had acne and it nicely cleanses the skin while drying out the acne. I like the subtle fragrance of multani mitti it. It also contains turmeric, which is good for giving a glow. 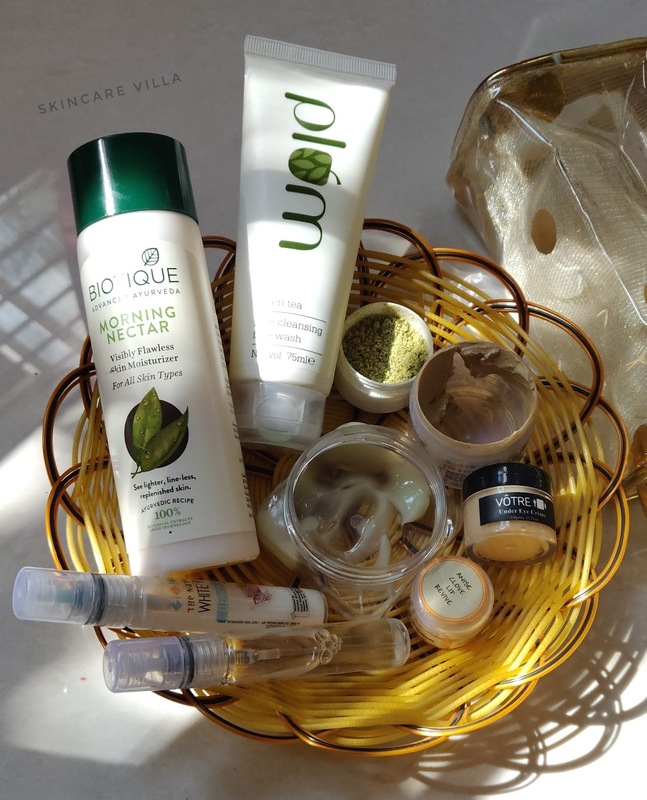 Overall a nice basic skincare face pack. I was bowled over by the effects of this face pack. It gives such a radiant glow to the skin and the smoothness it imparts is unmatchable. However once we wash off the mask it leaves a bitter taste in the mouth (like the ones when we apply raw aloe vera gel from plant). The scrubbing corn particles are also very large and we need to scrub very carefully so as not to hurt. A coffee scrub which ends up moisturizing the skin without exfoliating. The oil content in it is so much that the dead skin cells tend to stick to your skin instead of getting exfoliated. However it is good to apply it to body and especially back part where instead of scrubbing more of oiling is necessary. I love the earthy fragrance this Cleansing Powder has. I feel like eating it up eveyrtime I use it. I also used this Cleansing Powder as a body scrub and as well as an underarm scrub and detox mask. I love how it instantly brightens and deodorizes the underarm. I have a detailed Review of this shampoo posted in previous week. It's a repurchase for me and a cult favourite. Another good Shampoo for dry, frizzy hair. I had won this shampoo in a Twitter giveaway and used it on and off for about one year. The hair Cleanser is good for dry frizzy hair and it actually gives the hair a much needed bounce and softeness without weighing it down. However once we use it up on the scalp and hair it leaves a bitter taste in the mouth, seems like some effective penetrators end up in mouth too. Everytime I used it I tilted my head back so as not to let the shampoo (I dilute in water and then use on hair) on my face. I didn't repurchase the hair Cleanser for this exact purpose. It's a good one otherwise. 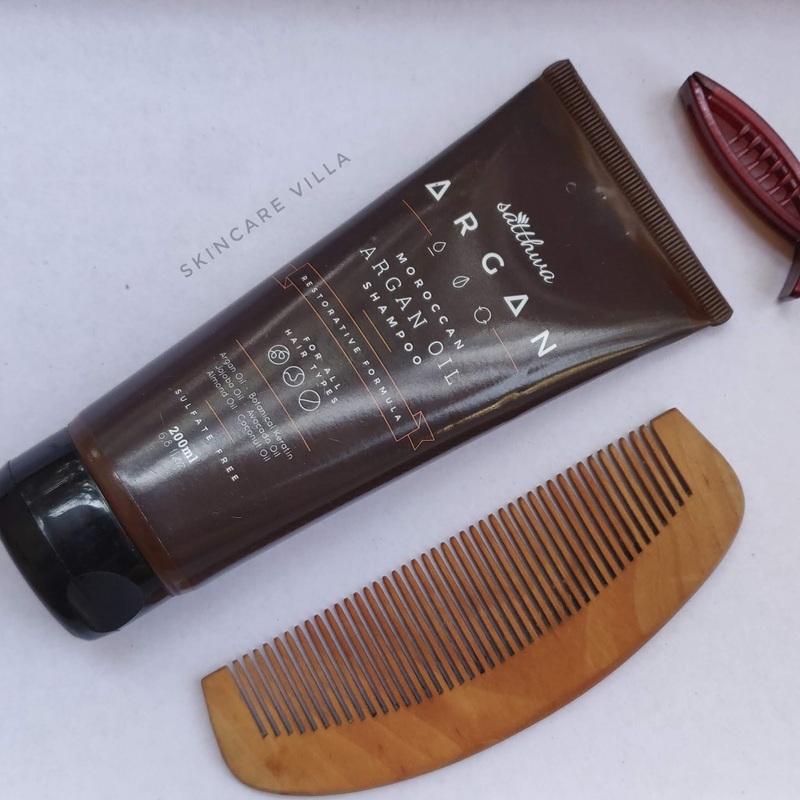 So out of the above list only one was a repurchase, the Satthwa Moroccan Argan Oil Shampoo as I really found it worth the price. Happy festivities and see you all in my next post which will be posted soon. 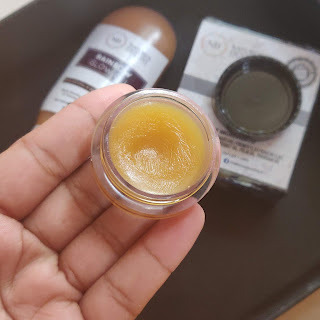 True to it's name this lip balm is the best ever one I have tried from handmade range. 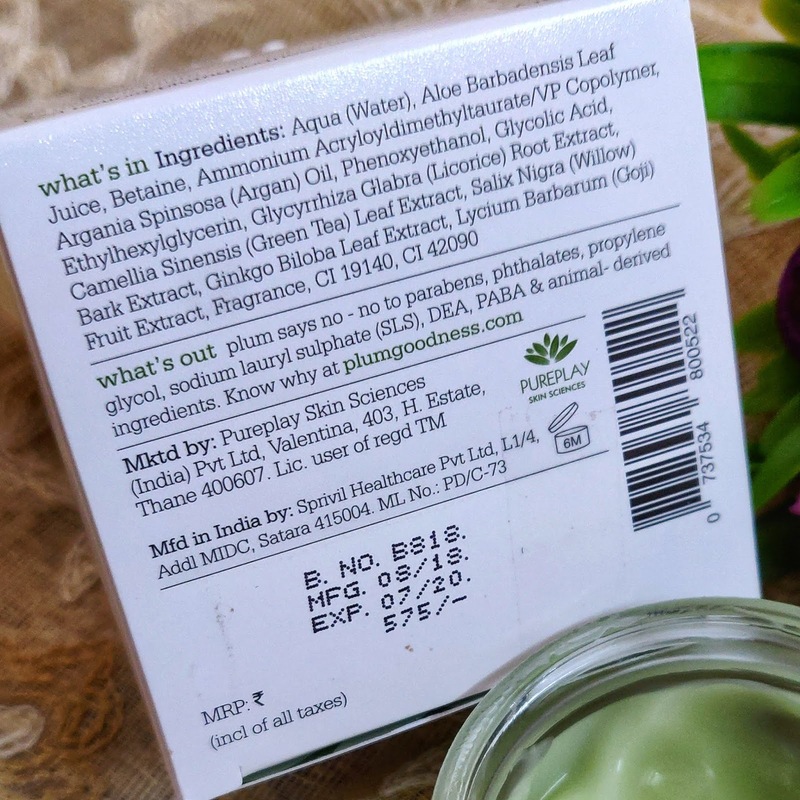 The star ingredient in this lip balm is flax seed oil. When applied at night the lip balm gives softness and moisturization to the lips for almost two days (if you don't wear a lipstick or tinted balm from another brand). I love using it as a sleeping lip mask which makes my lips ultra soft and nourishing. The lip balm fragrance is a bit unbearable due to flax seed oil, but I absolutely don't mind it keeping it's efficiency in mind. And I mostly end up using it at night so once I sleep who cares 😁. I haven't used any gel mask in the past. So this was the first time I used one. Rainbow Glow Gel mask is to be applied uniformly on the face and is to be kept for 10 minutes before rinsing off. The gel mask gave me little burning sensation when I first used it. Afterwards everytime I used it, it didn't tingle at all. Once applied it gives a cooling sensation to the skin. While washing off it becomes a little tedious task as some gets absorbed into the skin. After wash off all you are left with is a clean, superbly glowing and soft skin. I like the glow it imparts to the skin. The fragrance of the Rainbow Glow Gel is tangy orange which is very refreshing. They also have Rainbow Glow Mask for Dry and Sensitive skin type which is gel based and Ubtan Glow Mask for Oily and Combination skin which is dry powder based. Ingredients - Aloevera Gel, Cucumber Gel, Laksha, Pattanga, Kashmiri Saffron, Avocado Oil, Rosehip Oil, Orange Extract, Orange Essential oil and Preservative Eco. Am a lover of cold process soaps so I instantly liked this one. The earthy fragrance is so amazing. The soap cleanses well and leaves a soft skin behind. It is absolutely non drying for the skin. I love using handmade soaps on my face too and I use this on my face in shower too. So far am happy with this buddy as my shower saviour. Ingredients - Saponified Activated Charcoal, French Clay, Kaolin Clay, Shea butter, Mango butter, coconut oil, palm oil, poongam oil. There is no doubt that the natural process of aging isn't always kind to the vulnerable tissues of the face and neck regions. These areas are nearly always exposed to the elements and tend to take the brunt of damage from ultraviolet light as well. At the same time, people are enjoying longer lifespans than at any other time in history. So it just makes sense that as we are living longer, we want to look younger for longer as well! This has increased the demand for facelift procedures. And since patients choose to seek facelift treatments for different reasons at different ages and stages of life, this has also increased the demand for new and innovative approaches that require minimal downtime for maximum results. The mini-facelift and the multiplanar facelift are two such approaches that will be discussed in this article. This type of facelift is sometimes nicknamed the "weekend facelift" because it delivers visible results with minimal downtime and no use of general anesthetic. Dr. Jacono created the mini-facelift to address an increasing need and demand for a facelift procedure that can be done without extended disruption to people's hectic daily schedules. The mini-facelift can even be done with just local anesthetic while you are in a waking state to further minimize downtime. The mini-facelift can address concerns that arise from skin sagging due to age, tobacco use, sun damage and similar impacts. Typically a mini-facelift is done to address spot areas of concern such as lower cheeks and chin. Dr. Jacono sometimes calls this procedure the "S-Lift" because it employs shorter incisions than what is called for with a standard facelift. This can further reduce recovery times by reducing bruising and swelling. This S-Lift approach also makes it easier to strategically place incisions to minimize the chances for visible scars. What Is a Multiplanar Facelift? A multi-planar facelift is a more comprehensive procedure designed to address multiple areas of concern in the facial and neck areas. A multi-planar facelift takes its name from the facial muscle groups it targets: the SMAS muscle and the platysma muscle. This type of facelift can address deeper or more advanced needs by tightening the underlying deeper muscle layers of the face for improved results and shortened recovery times. If you feel like your face could benefit from a full lift, the multi-planar facelift might be the right treatment approach to achieve your appearance goals. If your primary area of concern is sagging, drooping skin in the mid to lower area of the face, a multi-planar facelift treatment might be the right approach for you. Dr. Jacono is one of a very small minority of plastic surgeons who specializes in the deep plane facelift. This is a modified, highly specialized version of the multi-planar facelift that works only on the SMAS muscle layer. By targeting this muscle group as a method to lift, tone, tighten and smooth the exterior facial skin, it avoids having to pull on any tissues to achieve the visual "lift" effect. This is the best approach for addressing smaller areas of concern such as the nasal folds, midface sagging, cheekbone sagging and other midface region concerns. See Each Facelift Type "Before and After" For Yourself! You can see examples of all three types of facelifts: the mini-facelift, the multi-planar facelift and the deep plane facelift, and read detailed notes about each procedure, on Dr. Jacono's "Before and After" picture gallery. As you do your research to identify your areas of concern and possible treatments to achieve your goals, you may easily begin to feel overwhelmed by all the new terminology and options! And of course you need to do your research for the plastic surgeon you select just as carefully as you research your procedure and treatment options! Your choice of plastic surgeon can not only inform the type of treatment you select, but also will have a huge impact on your results. Your surgeon's experience and training as well as positive patient testimonials can help you feel comfortable and confident that you will get the results you want and need. The first step to scheduling a facelift treatment, whether a mini-facelift, a multi-planar facelift or a deep plane facelift, is to schedule your initial consultation with Dr. Jacono. During your one-to-one consultation, Dr. Jacono will take your medical history and do a full examination of the proposed treatment areas. He will then make recommendations to achieve the best treatment outcomes with the least downtime and recovery time. In the hands of a skilled and experienced plastic surgeon, you may find that you can have a less invasive procedure and still experience the full results you hope to achieve. As well, you will have Dr. Jacono's expert guidance to prepare for and recover from your treatment, which will minimize any outside chance of scarring or other side effects. Dr. Jacono has created a proprietary treatment protocol called JPak Systems TM to reduce swelling and bruising from injectable and surgical treatments. You can use JPak to shorten recovery time and improve treatment results. Dr. Andrew Jacono, M.D., F.A.C.S., is an internationally sought-after surgeon, instructor, lecturer and researcher in the field of head and neck, facial plastic and reconstructive surgery. He serves as Director of The New York Center for Facial Plastic & Laser Surgery in New York, New York to provide cutting-edge, minimally invasive surgical treatments to local and international clients. Dr. Jacono is double board certified and is one of just 70 surgeons who serves as an Advanced Fellowship Director for the American Academy of Facial and Plastic Surgery. To learn more and schedule your initial consultation at Dr. Jacono's Long Island or Manhattan office, please visit us online at www.newyorkfacialplasticsurgery.com. I am back with another interesting review about a new brand called Greenie Mill. It is owned by a certified formulator named Madhumita who also blogs at Cute Girly Studio. I like using different kinds of cleansers, foaming, powder, cleansing milk, cleansing cream. I mean like we have a lot of variety so why not 😁. Once in a while I like using a deep oil cleanser or cream cleanser to get rid of the dirt and grime on my skin. Lately I have been using the Greenie Mill Hemp & Tamanu Gel to Milk Cleanser and am head over heels in love with it. Let's read on to know. The cleanser is loaded with ingredients which are beneficial for oily, acne prone skin. I will talk about packaging and ingredients in the next section and would like to speak about the product efficiency here. So I have used this cleanser for straight 3-4 weeks, twice per week. That is approximately I have used this cleanser for about 6-8 times roughly. The reason why I use it twice a week is that I don't use makeup at all except very rare special occasions. I usually use this cleanser during evening when I am ready to call the day off and I don't have to step out of my home. I apply the cleanser as instructed by the brand. While splashing water the cleanser turns milky and leaves a nice squeaky feeling on the face. It doesn't make the skin that soft as you would expect an oil cleanser to do, but it definitely doesn't strip the moisture too. Coming to the efficiency of the product, I have tested this product in my whole hormonal cycle (if you know, the periods wala thing 😔). Usually my skin gets cystic acne or small zits before the onset of my cycle and after 15 days of that time of the month. So I have used this product in the highs and lows of my skin condition. It effectively keeps acne in check, I didn't get a single breakout during this month. My whole skincare routine is pretty much same except the addition of this new member to my Skincare Villa familia. 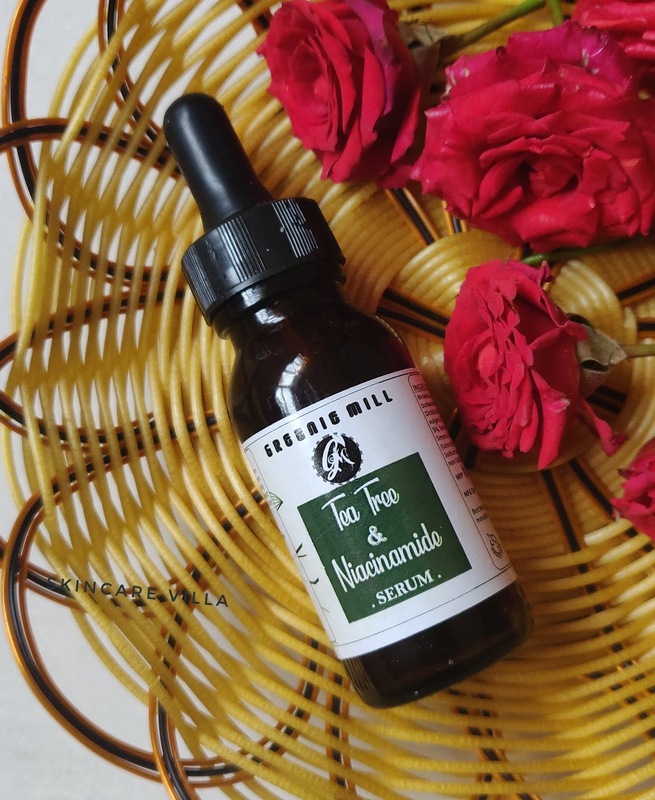 I highly recommend the Greenie Mill Hemp & Tamanu Gel to Milk Cleanser to oily acne prone skin conditions to keep acne at bay and reduce your breakouts. If your skin breaks out due to some other reasons and not due to hormones then I will definitely recommend this one to you. 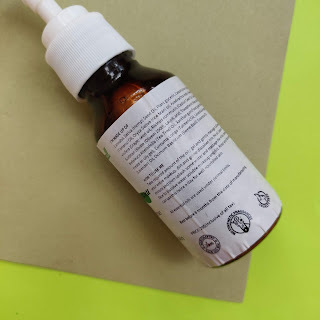 I don't know what you will look into an anti acne product, if not this which can reduce hormonal acne from popping up. It is on my repurchasing list already 🤩. If you are looking out for some anti acne products I would suggest to give Greenie Mill Hemp & Tamanu Gel to Milk Cleanser a try. It has effectively reduced my hormonal acne and zits. Am happy with the product and this is on my repurchase list already. Even after been into skincare from the past few years I have never had a chance to use a special vitamin E cream. Not that it never crossed my mind, but with so many brands in the market choosing a good one was a real task. 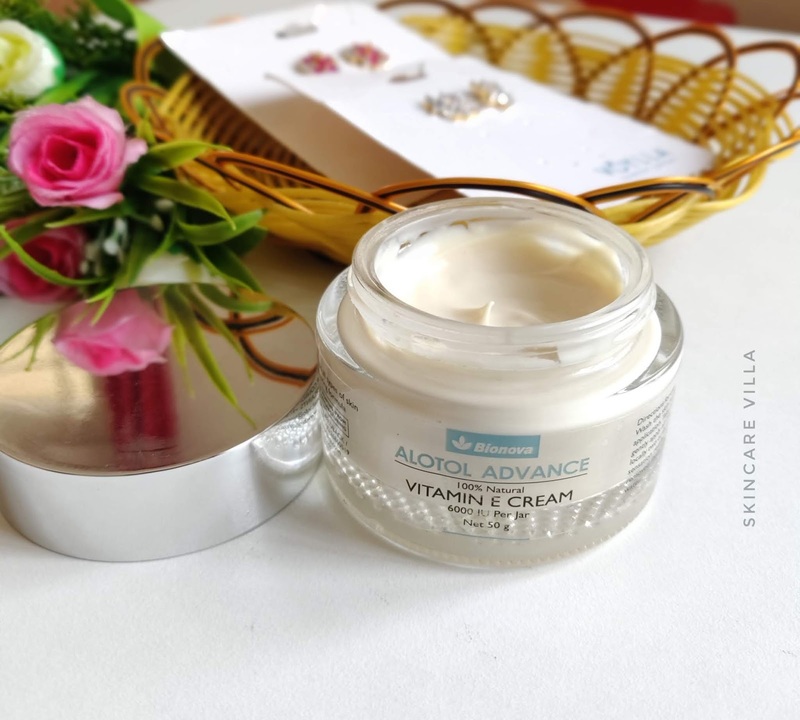 Recently I had a chance to use and review Bionova Vitamin E cream. After using it for 3 weeks here is my review on it. ALOTOL ADVANCE is a skin care formula from Bionova with skin rejuvenation and intense moisturization properties. With natural vitamin E as the key ingredient, ALOTOL blocks the free radical activity and protects the skin against acne breakouts that are triggered by free radicals. ALOTOL cream protects the skin against photobiological damages such as sunburns, dark spots premature aging. As an antioxidant, vitamin E stimulates skin cell division and improves the structural integrity of the skin. This product works well on all types of skins. The product is housed in a luxurious glass jar. It has an inner lid to prevent product leakage. The outer lid and inner lid are perfect to keep leakages and spillage in check while travelling. I really like the luxurious packaging. The quantity of the product is 50 gms and the jar was filled to brim. Even after using continuously over 3 weeks am not able to finish even 1/4 of it. Coming to the colour, it is very light beige coloured product. The fragrance can be a bit bothering if you have a sensitive nose like me, but the fragrance is definitely not headache inducing. 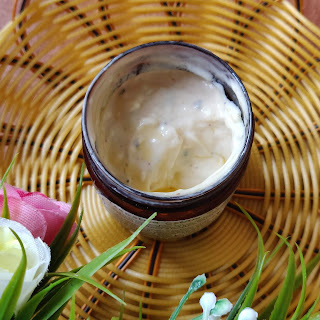 The texture of the cream is beyond amazing, rich, thick yet non greasy, non oily. The cream gets absorbed easily into the skin without leaving any oily residue. 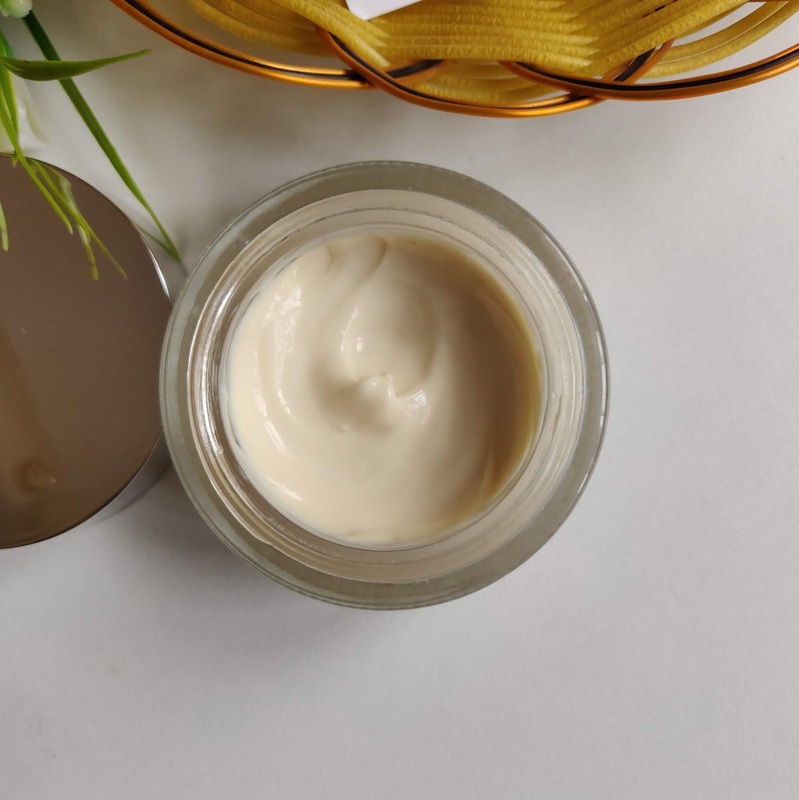 The cream contains natural vitamin E and not synthetic vitamin E. Synthetic vitamin E gives only effect to the skin as moisturiser. Whereas, natural vitamin E works not only as moisturiser but also gives additional benefits as skin cell rejuvenation, anti-ageing & anti oxidant properties. I have used this cream during day and it moisturizes the skin sans oily or greasy residue. During the day the cream sweats a bit so I started using it at night when the skin repairs and rejuvenates. With regular use I wake up to baby soft, plump, smooth and even toned skin. The softness of the skin is too much to handle and I keep on touching my face often (guilty of this though 😝). I have even used the cream on my elbows and to my surprise the cream has even softened and brightened the rough elbows (😝😝). All in all I love the effect this cream has on my skin. I would however recommend using it only once a day for oily acne prone skin, as it intensely moisturizes the skin. Dry and normal skinned beauties can use it day and night. Some days back I had a rash due to a facial tonic, and I didn't skip using this product. To my surprise it soothed and calmed down the rashes in two days. I like the fact that Bionova Vitamin E Cream is true to it's claims of giving a youthful looking skin with regular usage. The Bionova Vitamin E Cream not only makes the skin smooth but also softens elbows and rough patches. This will be more suitable to dry, normal and combination skin types. Oily skinned beauties can use once a day as it intensely moisturizes the skin (I have oily acne prone skin). This cream however didn't cause me any breakouts, so rest assured about it's efficiency. Grab this cream if you can, as it gives amazing effects on the skin.